Colson Group is committed to the environment and reducing waste where possible. In an effort to continue protecting valuable resources, we offer all of our caster catalogs and supporting literature in digital form for digital consumption. We strongly encourage our distributors, partners, and customers to utilize the digital content when possible. If printed versions are a must, we kindly ask that you use the request forms on this site to request enough catalogs or copies for your need. Please note: our digital content is more likely to be accurate and up-to-date than printed versions. Albion full-line catalog. 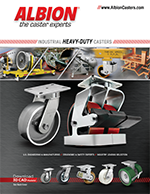 Casters for heavy duty manufacturing, automotive, aerospace, material handling, and more. Albion Mini Catalog features our post popular series, wheels, and accessories. Casters for heavy duty manufacturing, automotive, aerospace, material handling, and more. Explore an ovrview of the Colson 16 Series - our most popular 2" caster solution. The Albion 16 Series rigs, and many wheels, are USA made. Additional wheels and options are available, but this flyer focuses on the most popular. 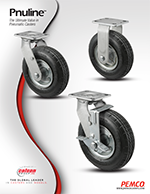 Recommended Albion casters for Aviation and Air Cargo industry needs. Includes Kingpinless, Spring-Loaded, and Dual Wheel casters with individual capacities up to 30,000 pounds. 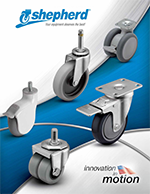 Recommended Albion casters for Automotive Manufacturing and Material Handling industry needs. Includes Maintenance-Free, Kingpinless, Spring-Loaded, and Dual Wheel casters with individual capacities up to 12,000 pounds. Additionally, find recommendations of ergonomic caster wheels. 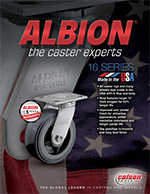 Introduction to the Albion 310 and 410 family of laser-cut Kingpinless casters. 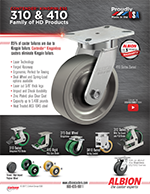 Albion 310 and 410 Series offer 2.5-inch and 3-inch wide casters, with capacity support up to 5,400 pounds. Laser-cut and assembled in the US for quick production and delivery. 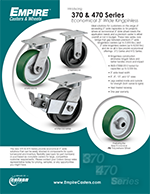 Introduction to Empire 370 and 470 economical 3-inch wide kingpinless casters. 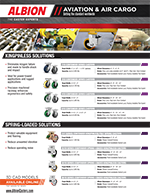 Kingpinless casters eliminate kingpin failure, the leading cause of caster failure. 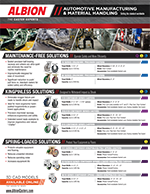 This flyer provides a series overview, along with component part numbers to allow quick custom caster configuration. (RW) Retort Wheels - Now USA Made! 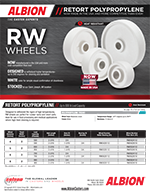 Our Retort Polypropylene (RW) wheels are now made in the USA! Designed to withstand higher temperatures, our RW wheels are perfect for cooker racks and retort carts. Colson full-line catalog. Casters for material handling and institutional needs. Featuring industry-preferred Performa rubber wheel. 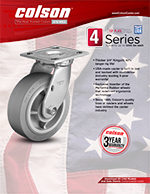 Explore an ovrview of the Colson 4 Series - our most popular 2" caster solution. The Colson 4 Series rigs, and many wheels, are USA made. Additional wheels and options are available, but this flyer focuses on the most popular. Quick-Pick guide to the Colson 2 Series. 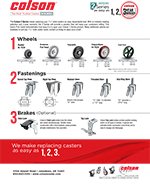 Replacement casters are as easy as 1, 2, 3-year warranty! 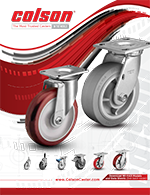 Colson 2 Series are 1.25-inch wide institutional casters with numerous wheel, brake, and fastening options. This flyer is an overview of the series. Additional wheels are available. 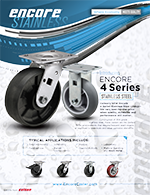 Overview of Colson Encore 4 Series Stainless Steel casters. Encore is Colson's economical line of casters - budget friendly caster options with a 1 year warranty. Shepherd full-line catalog. Casters for institutional uses along with commercial furniture manufacturing. Smooth, Quiet, Clean. 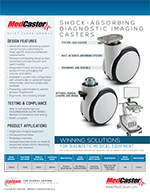 MedCaster full-line catalog. 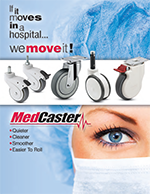 Casters for medical uses, including hospital furniture, equipment, and central locking systems. First introduced at MEDICA2018 (Germany), MedCaster's newest casters offer a smooth, quiet ride. RoHS compliant and tested to meet global standards, these shock-absorbing casters integrate perfectly with system-lock equipment. First introduced at MEDICA2017 (Germany), the MedCaster Avant casters are maintenance-free nylon casters perfect for quiet mobility. 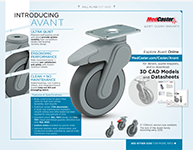 Available in numerous wheel diameters, and configurable with many fastening options, Avant are ideal for medical equipment. Jarvis Food Service Mini-Catalog. 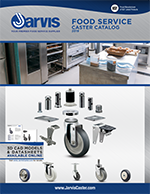 Explore recommended casters and mobility solutions from Jarvis for the Food Service industry. This catalog highlights several caster series and custom solutions for food service needs. Explore Pemco E-Line Brochure. E-Line is an economical 2" caster solution, allowing for customization to your specific needs. 5 brake options (plus rigid brakes! ), 9 wheels, 4 bearings, numerous combinations. 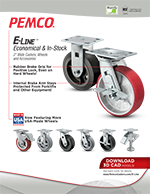 Introducing Pemco Pnuline - Economical Pneumatic Casters. Budget-friendly pneumatic casters available in 8-inch, 10-inch, and 12-inch diameters. Swivel, Rigid, and Brake options available. New Shopping Cart Products. 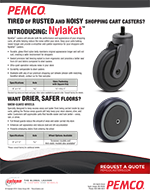 Pemco NylaKat Nylon Shopping Cart Casters resist rust and provide quieter cart operation. Pemco Snow-Guards are full-wheel thread guards specially designed to reduce water and snow intrusion, ultimately providing a drier and cleaner shopping experience. 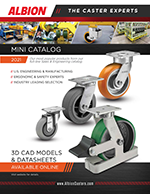 Caster Catalogs is a marketing website available at http://www.castercatalogs.com. This site is operated and maintained by Colson Group USA. To visit Colson Group USA, please use http://www.colsongroupusa.com. Website users (customers) who voluntarily fill out a literature request form on this website are permissing Colson Group USA, its employees, and its partners to utilize personal information, such as name, address, phone number, and e-mail, to contact them. Colson Group USA will use the information received to mail the requested print literature to the user. Colson Group USA may also use data provided to forward customer information to distribution partners if the customer qualifies for sales interest. Customers who are concerned about their data being used to receive mailings are encouraged to utilize the PDF and digital versions of the literature provided on this website. Product specifications and availability subject to change.